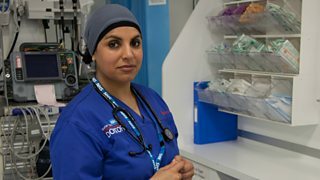 BBC Two - Trust Me, I'm a Doctor, Series 3, Episode 1 - How do I recognise a Deep Vein Thrombosis? One in nine of us will develop a deep vein thrombosis during our lifetime. This in itself is not life threatening, however if it breaks away and travels to the lung it can result in a pulmonary embolism, which can be fatal. There are three main risk factors for DVT: sticky blood, vein damage and immobility. Sticky blood can be caused by illness, old age, pregnancy and medication while vein damage can result from trauma such as surgery. Discomfort, which can often masquerade as something else such as muscle strain. Swelling – measure your calves, and if one is 3cm or more wider than the other, then that is a very important red flag. DVT has long been associated with air travel; however being in hospital is the one factor which actually accounts for the highest number of cases. As we lead more sedentary lives, experts have also coined a new term: ‘e-thrombosis’. This identifies the growing number of DVT cases in which long periods of sitting at a computer without getting up has been the prime cause. The symptoms can sometimes be hard to spot, however there are easy guidelines we can follow in order to significantly reduce our chance of developing one in the first place. Whatever our daily routine, it is important to ensure we stand up regularly. Evidence has shown that sitting for 90 minutes can reduce the blood flow in the legs by half. Instead, it is recommended we get up every half an hour to an hour, stimulating the muscles and pumping blood around the body. This prevents it from pooling and staying in the same place. At the same time, stay hydrated, and make sure your seat is comfortable and appropriate for your height. If you are at a particularly high risk however, a course of “blood thinning” medications may be necessary to prevent fatal clots. Taking these preventative measures will reduce your risk, and recognising when to seek treatment could ultimately save your life.